Two months after the birth of his son Guillaume on January 11, 1833, Eliza Dillon died from a puerperal fever. All his life the child bore this unbearable weight: he had caused the death of his father’s beloved wife and his sisters’ perfect mother. Whilst all the family birthdays were an occasion for celebration and tenderness, his was like a day of mourning: “You will be thirty tomorrow, his father wrote. What joy! But that resulted in such pain! The only response to such turmoil of the soul is silence”. To this latent guilt that he felt so deeply, will be added the overwhelming figure of his brother François, who died when he was four years old, the idealised son whom he should but can never replace. “My dear little Guillaume is my child”, his father wrote after the death of François, “but this is not my son. And who knows if he ever will be?” Twelve years later, the sixteen year-old still dwelt on this, when he suggested with infinite delicacy: “I never dared talk to you about my poor brother François; but I know how much tenderness and confidence in the present and the future you had placed in him. I did not want to take his place. Is it not true that the heart does not have to cast out one sentiment in order to accept another?” The father, although very touched, did not understand at all: the hopes he placed in François, “it will be you, dear child, who will be responsible for achieving them.” This ambiguity will never really be resolved. Guillaume was seven years old when Guizot took on the Ministry of Foreign Affairs. Despite the protective affection of his sisters and the time that their father managed to preserve for his children, he felt the inevitable distance that ensued. He rapidly revealed exceptional literary talents and after entering the Collège de Bourbon, he successfully passed all the competitive exams, to the great satisfaction of his father and the entire family. He was a pleasant and charming friend, and became the favourite of the school, even amongst the older pupils, including Cornélis de Witt and Hippolyte Taine. In February 1848 his world fell apart. From the pleasant life on the Boulevard des Capucines, he suddenly found himself in exile and reclusion in a little house abroad, alone with his father as a replacement tutor. At least he was able to perfect his knowledge of the language and English literature. 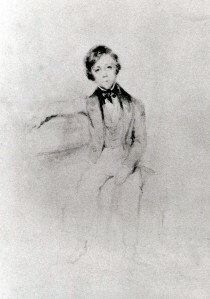 On returning to Paris in 1849 at the start of the new school year, he easily completed the final years and rhetoric classes but more importantly, he discovered freedom with a group of faithful friends, in a young man’s existence of wild parties with actresses such as the famous Rachel, large cigars and soon gambling and therefore debts, that his family, who did not know all the details, tended to both ignore and overestimate. This pleasant and distinguished young man was not lacking paternal lectures and admonishments, but “is doing more or less nothing, and never follows anything through”. For many years, advice came from all quarters, but he avoided and eluded it, always with the same sharp wit: “I would have talked to you about many things, but for fear that my father would mention them to M. Guizot.” He did indeed speak about many things, in particular literary activities – as he was dealing with relations between Guizot, now living most of the time at Val Richer, and his principal publisher Michel Lévy, who became a close friend – and also politics, where he was less conservative than his father, but he could not discuss Flaubert, who he admired, Georges Sand, with whom he maintained a correspondence, Baudelaire, who dedicated one of the first Les Fleurs du Mal poems to him or Wagner’s Tannhaüser, the premiere of which he attended on March 13, 1861 – an artistic world that Guizot did not appreciate. But Guillaume, alone in the family workroom, produced practically nothing: an essay on Ménandre in 1853, another on Alfred the Great three years later, and finally the translation of Macaulay’s essays. He never completed his thesis on Montaigne. If work was not the cure for his expensive dilettantism, perhaps marriage would stabilise him. Guizot took the matter in hand in 1851, prospecting amongst the daughters of Protestant bankers. This came to nothing, mainly because Guillaume had other attachments, but that the family could not possibly accept: “Does one owe it to one’s family to find happiness where they believe it lies, and not where it actually is?” he wrote to his friend Victor Figarol. Salvation came from Gabrielle Verdier de Flaux, the niece of a childhood friend of Guizot’s from Nîmes, 20 years old, “well turned-out, a distinguished and pleasant face, thick hair, an intelligent and well-to-do air, good manners”, wrote Guillaume who had gone to see the lay of the land, plus the promise of a solid fortune. 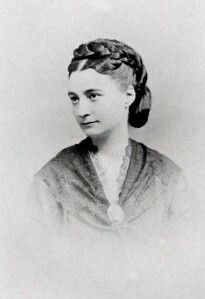 The marriage was celebrated on April 26, 1860 in the Great Church of Nîmes by the pastor Jean Monod. Reintroducing the name of Guizot could open the way towards the General Council of the Gard department, but a tentative in 1884 was not conclusive. The marriage itself was not unhappy as such, for Guillaume, as always, demonstrated great kindness and wit, but it was not happy either. Both had very different backgrounds and characters, and sadly for Guizot, who went out of his way to be affectionate and attentive towards his daughter-in-law, they never had any children. Guillaume did not give up all of his bachelor’s habits. 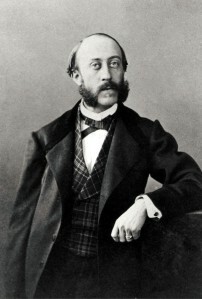 Instead of preparing his lectures to the Collège de France, where he was temporarily replacing Louis de Loménie, the son-in-law of Amélie Lenormant, he went out on the town and disaster ensued: at the beginning of 1886, rumour had it that to honour a gambling debt to be paid immediately, he went directly to Napoleon III for help, who was said to have given him 50,000 francs in gold. Guizot, who was opposed to the Empire and whose honour was at stake, discerned a part of the truth revealed to him by a tearful Gabrielle, but even she did not know the whole story. “Monsieur Guizot is publishing his Memoirs to pay for his son’s!” the Parisians said laughingly. 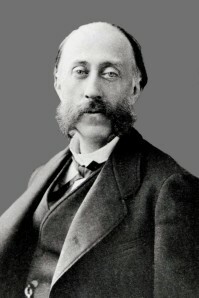 Apparently without either complaints or reproaches, Guizot managed to advance the amount required to “extinguish all the slander, all the wild suppositions” which were actually fewer than he thought. But at least Guillaume must start to work! A chair in literature was waiting for him at the Sorbonne, thanks to the Minister Duruy, if he only would agree to continue his thesis, but no, “the pressure from outside perturbs him more than it motivates him”. This project had to be abandoned, the only other choice being a deputy position in the Collège de France, which in fact worked out successfully as Guillaume could not avoid the fact that he was talented. In April 1870, thanks to the influence of Emile Ollivier, who he supported politically, Guizot obtained for him the sub-directorate of the non-Catholic religions department in the Ministry of Justice. However, he was not offered the French Embassy in Athens, which had been promised to him in the summer of 1871 by Thiers: no doubt his over-effusive letters of gratitude to the Emperor had been discovered in the Imperial papers. At least as deputy director, Guillaume helped to organise the synod of the Reformed Church in 1872, in which his father played an important role both before and during the event. In 1874, not long before his death and no doubt on the instigation of Empress Eugénie, Guizot had to face the public disclosure of Napoleon III’s generosity to Guillaume, no doubt only then discovering all the facts. He was determined to reimburse Eugénie and to do so, sold a painting by Murillo given to him by the Queen of Spain in 1846. However, his death interrupted the procedure. In 1874, Guillaume obtained the position he really wanted, the chair of Germanic languages and literatures in the Collège de France, whilst retaining his post in the Directorate of non-Catholic religions. Well thought of in literary circles for his learning and his reliable taste, he seemed now to be far more settled and was, if not a perfect husband, at least a much-loved uncle to his nephews and nieces and a sought-after friend. This attractive and gifted personality who was disappointing in his weaknesses and no doubt overwhelmed by the stature of his father, died on November 22, 1892 in the house previously belonging to his family-in-law, near Uzès.